The Risks of Unmonitored Hydrogen in Battery Installations white paper dives into this critical topic, thoroughly examining the hazards of hydrogen relative to stationary battery installations, fire code regulations and hydrogen-monitoring best practices. Every year, there are countless safety concerns raised by unions and individual employees regarding the possibility of gas explosions, and it is important to understand how to reduce or completely eliminate these concerns. Installing the SBS-H2 hydrogen detection system on site will eliminate most of these concerns, saving management time and money, while also increasing safety and giving employees peace of mind. In existing battery rooms, fans can be controlled by using the built-in relay to activate when the hydrogen level exceeds 1% gas concentration. Additional SBS-H2 safety features can be integrated with fire alarm panel zones, building management systems, network monitoring hubs, and can interface with MODBUS and SCADA systems. Signals a red LED ‘Alarm’ light when hydrogen concentration reaches 2% or more. The ‘Alarm’ relay contact will also close allowing users to shut down the system or initiate the building alarm. 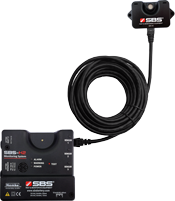 At under $1,000 per unit, the SBS-H2 is a sound investment that will be a valuable safety addition to any battery charging area.